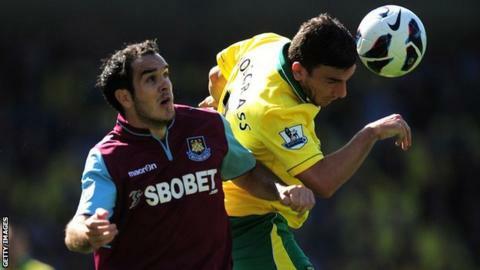 Norwich are still searching for their first win of the season after a goalless draw with West Ham. The hosts had appeals for a first-half penalty rejected, with the referee correctly adjudging Andrew Surman to have been fouled just outside the area. West Ham crafted several openings too, with Canaries keeper John Ruddy forced into a number of point-blank saves. There were enough chances today for this to finish 2-2. Norwich loanee Harry Kane had two really good chances after coming off the bench, but couldn't find the breakthrough goal. It's all a bit frustrating for the Canaries, and West Ham will be the happier of the two teams with the outcome. But neither side could break the deadlock, leaving Norwich winless and West Ham frustrated on their travels. The visitors were having to manage without loan signing Andy Carroll, a hamstring strain ruling the forward out of the Carrow Road contest. Carlton Cole deputised in attack for the Hammers, who started the stronger in an open, fluid game. The Canaries' England international goalkeeper Ruddy was forced into a series of impressive close-range saves, denying Ricardo Vaz Te, Cole and Kevin Nolan in the space of eight first-half minutes. In response, Norwich surged forward with Surman - brought into the starting XI to replace the injured Anthony Pilkington - curling a dangerous effort just wide of Jussi Jaaskelainen's right-hand post. When Hammers centre-back James Collins then dived in recklessly on the same player on the edge of the box, there were vociferous penalty appeals. However, referee Chris Foy - who had already turned down one Canaries claim when Robert Snodgrass fell under the challenge of West Ham captain Nolan - was adamant the foul was outside the area. He awarded a free-kick and cautioned Collins, Norwich failing to profit from the dead ball. Norwich continued to have the better of the game in the second half, Simeon Jackson cracking a fierce 25-yard drive at Jaaskelainen that the Finn could only palm over the bar. The Canaries restricted West Ham to a series of corners and long-range efforts, with substitute Matt Jarvis blazing over from distance, and they could, and possibly should, have snatched a win at the end. On-loan Tottenham teenager Harry Kane advanced on the West Ham goal having been played through by Snodgrass, only to shoot tamely. Moments later Kane beat Guy Demel and tried to return the favour by cutting the ball back to Snodgrass, but the Scotland international's effort was blocked. A header from Steve Morison straight at Jaaskelainen was the last action of the fixture, as Norwich recorded their first 0-0 draw in the league since January and only their second clean sheet in 18 games. "We will look at the positives as it's a clean sheet against a strong powerful West Ham side who will trouble a lot of teams this season. "But we had better chances and, as long as we can continue to play with that tempo and attitude, it will come. I'm disappointed as I felt we could have won. "It's about quality and a little bit of fortune. We got into some very good positions and that final decision or pass could have been a little better. "If we weren't creating chances I would be worried. Harry Kane will learn a lot from this experience. I think he will be a super player." "For a goalless draw it was particularly exciting considering the amount of chances there were. In the end, neither of us had the quality to put the ball in the net. "From our point of view it is a well-earned point. "It is our first point away from home this season and another clean sheet is very satisfying. That's three clean sheets from four since our return to the Premier League and that is a basis to build from."